After a major storm it is important that homeowners identify and assess damage to their roofs. Different roofing materials will react to impact and weather conditions differently, but consistently. 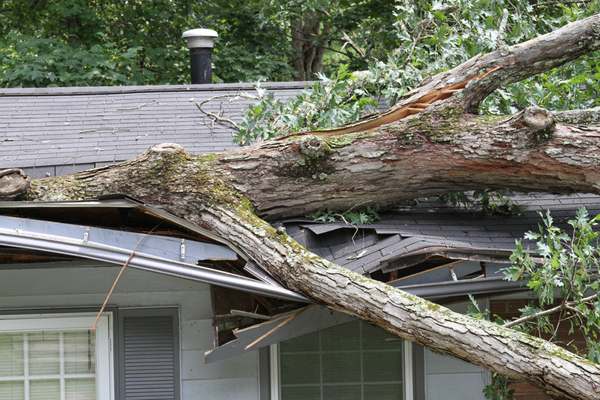 A large majority of homeowners may suspect exterior damage as a result of a storm. However, our experienced staff at Rosehill Roofing is able to distinguish between storm damage and natural weathering over time. Hiring a reputable and professional inspector is recommended following a severe storm. This will ensure the longevity of your home’s exterior, provide peace of mind and safeguard your family. A vast amount of homes have rooftops constructed of asphalt shingles. Typically, these shingles will show signs of weathering over time through a loss of mineral granules. This will appear as “bald spots” which are formed over time by sun exposure. Contrarily, a roof that is damaged by a hailstorm will lose a significant amount of granules instantly. These granules will be found in high volume inside the homes roof gutters. This sudden deterioration of shingles will drastically reduce the efficiency and service life of your roof. Heavy granule loss calls for prompt repair or replacement. If your roof is not asphalt shingles, it may be wood, medal, tile, or slate. Hail damage to these materials is also easily identifiable by our professional staff. Tell-tale signs of hail damage will be cracked or missing shingles. It is also possible during an extremely damaging storm for an entire section(s) of a roof to suffer more extensive losses. This type of destruction is distinguished by dents and bruises on the damaged areas. Hail damage of this severity may also create water leaks which could compromise the interior of your home. Imminent repairs are highly recommended. Roofs are resistant to wind by design. The majority of roofing materials, however are not able to withstand extreme high wind conditions. Wind damage begins at the edges of a roof and peels upward. If loose materials are present, powerful winds are capable of flowing underneath the roof and lifting off parts of the roof. If this happens, the damage will be extreme and harsh, requiring immediate replacement or repair. Mercifully, wind damage alone is very rare. However, extreme wind conditions, such as a tornado, have the potential to result in airborne debris which poses an immediate physical threat. These types of powerful storms will disburse anything from tree limbs to air conditioning units across homes and neighborhoods, resulting in heavy and very obvious damage. Most homeowners will assess this level of wind destruction instantaneously.